No Man’s Sky – Humans Don’t Rule the Planet Anymore But They Can Certainly Explore It! ‘No Man’s Sky’ is a open world adventure game whose best aspects are its amazing visuals, the visual effects, and the game world’s ability to build upon itself as the player progresses through the game. It is set to release in the year 2015 for PC and PlayStation 4 gaming platforms. This video game falls firmly under the adventure genre of video games and works as an exploration game as well. ‘No Man’s Sky’ is a procedurally generated game world wherein the world and environment constantly builds on itself. 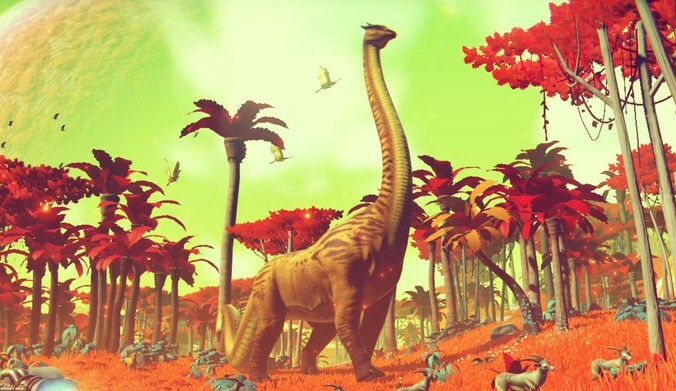 This means that players will have a lot of interesting new sights, planets and worlds in the game world of ‘No Man’s Sky’, and that is possibly the most alluring part of the game! However, in the game world of ‘No Man’s Sky’, it is not only the planets and environments in the world that builds on itself and develops, but that principle also applies to the various animals found in this world! As the player explores the virtual world of ‘No Man’s Sky’, he or she will encounter a number of planets in this universe to explore. And the landscape, wildlife, and environments in each of these planets (or worlds) is supposed to have its own life and differences. All these situations and actions are interconnected however. And the world will develop in certain ways based on how the player proceeds in the game and what decisions he or she makes within the game’s world. In this world, the player becomes a planetary explorer that also navigates and has a spaceship for interplanetary travel. It’s not all just exploration though – or it wouldn’t be an adventure game. As you travel through space, hostile parties could attack and you may be called to attack or defend yourself – or a world – as the case may be or the situation requires. On a particular world, you will most probably have to collect a variety of necessary materials and fulfill all kinds of tasks – not to mention fight alien life forms and wildlife as well in case they are hostile. What the game really entails though, we will only know once it is released. But the few sneak peeks we have got of it so far has certainly whetted both our gaming appetites as well as sparked our anticipatory interest in this game! As stated before, a gamer will take on the role of an interplanetary explorer in a spaceship in this video game. With this spaceship, players can travel from one world to the next, as well as explore the surfaces of each world and planet, interact as well as collect materials, flora, fauna, oceans, and wildlife in each of these worlds. The player will also be placed in combat situations with alien creatures and enemy forces that are hostile. The game has also been purported to offer online features which will let players share various details of the worlds they have visited within the game with other online players of the game. And these details are said to enable the other online players to visit the same worlds and planets as well. A large “galactic map” is what will allow online players to visit these other planets that their fellow players have talked about. The spacecraft will undergo upgrades throughout the progress of the video game as well. The spaceship will have a “hyperdrive” ability as well, depending on how much and at what level a player has managed to upgrade their spacecraft.